I was reviewing the pictures of the original benches as I was laying in bed (look I get a bit obsessed at the start of a project) when I noticed that I had missed the substantial seat overhang on the ends of the bench. After a bit of SketchUp work I decided on 3.5 inches of overhang on each side meaning my original seat length was 6 inches short. Luckily I had been unable to decide on a grain pattern so I had not cut the board yet. The extra 6 inches of length set the grain pattern so I felt confident making my rough cuts. Planing this thing is going to be a frustrating experience with tear out. I also managed to square two edges on the pieces for the base (the seat needs a week in the shop to acclimatize) so hopefully I can set up the planer sometime this week. I made some buttons out of left over red oak, attached the top, and applied some wax. Feels good to be done. Now for chairs and a bench. 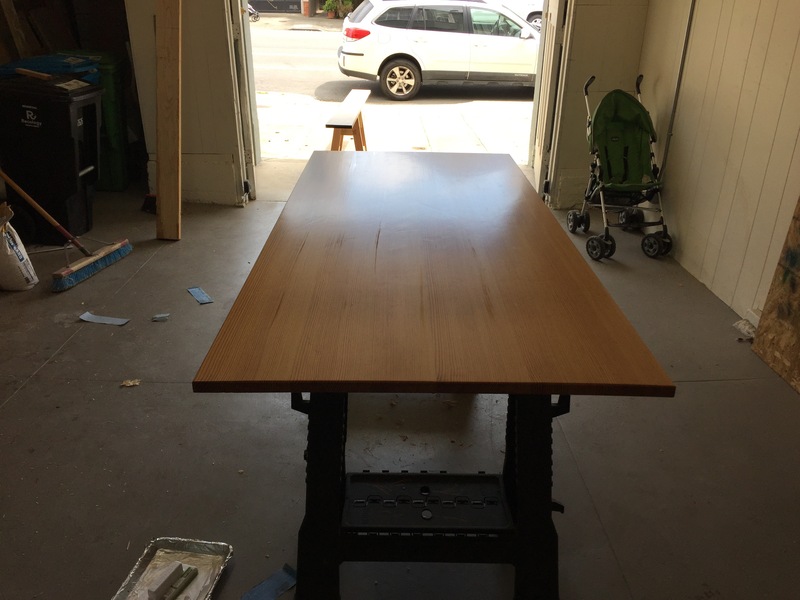 Earlier this week I was perusing some of the older projects on Jack Plane’s blog Pegs & Tails (if you don’t already read it I recommend you start) when I noticed his Ash Cricket Table. I had been trying to decide what wood to use for the bench seat and after seeing the beautiful color Mr. Plane was able the to achieve I decided to go with an ash for the top. Saturday morning I drove to the wood store in the city to look for a 5/4 board (they had no 6/4 ash when I was there last weekend) that would be long enough to provide both sides of a glue up for the seat. When I arrived I was pleasantly supprised to find they had received a small shipment of 6/4 ash and that it included quite a few wide boards, some up to 18 inches wide. All of the wide boards had “cat face” grain changes so finishing will be interesting. In the end I narrowed it down too two boards, one that was just barely wide enough but had some curly figure plus some of what Mr. Plane called olive coloring and one that had almost an inch of extra with but had a couple of knots. In the end I took the board with the less interesting figure because the extra width gave me peace of mind. I also picked up some 8/4 popular for a chalked chair seat and then hurried home to take my some to swim class. The saw actually sharp enough to use when i got it home. On the way home from swim glass I noticed a garage sale that appeared to have some rusty tools so after we got home I walked over to have a look. What I found was a weird mix, shoe cobbler tools, axes, rusty metal working tools, and other odds and ends. I found a few items that may be salvageable. One of the carpenter’s side axes had a loose handle so it has already found an electrolysis bath. The rest of the afternoon was spent rough milling the parts for the bench’s base, my Wood Slicer band saw blade continues to amaze me. Going to be a lot of planing work this weekend getting everything squared up for joinery. I have trimed off the knots at the end of the seat board (and the checks ) but I cannot decide which section of grain I want to use. I really like the look of the knot but I think it will complicate finishing and I’m already going to be using some new tequnique soft this one. On the way home from work last night I was reading the woodworking sub-reddit and I noticed several posts about rust removal. It seems like very few people are aware of how cheap and easy it is to use electrolysis to remove rust from tools. Over the past few years I have used a pretty simple setup to strip the rust / paint off of my tools and I have been VERY happy with the results. That said, I am in no way shape or form an expert on the subject so I do not know if this is appropriate for any collectable tools, but it works great for my users and involves little if any harsh chemicals or fumes. I have never used EvapoRust but I used Navel Jelly and other similar products when I worked on the restoration team at the USS Missouri Museum and this process is safer and cheaper. Plus there are no air-born particulates. Electrolysis uses direct current (DC) power to transfer material from one piece of metal to another via a solution. In our case, we are transferring Iron atoms from a sacrificial piece of metal to the tool in order to convert some of the “Red Rust” (ferric oxide) to “Black Rust” (magnetite). The piece of metal to be cleaned is connected to the positive (red) terminal and the sacrificial piece is connected to the negative (black) terminal. As the electricity travels through the solution, iron atoms are transferred from the sacrificial steel to the tool (along with some oxygen from the water) changing the Fe2O3 into Fe3O4. In the process, the red rust that is not converted into black rust will come off and drop into solution. Black rust is non-destructive (it does not flake) and it does not hold moisture like red rust so it actually helps to protect the metal from further rusting. I’m not a chemist so take this all with a grain of salt. Most of the setups I have read about online used car batteries or battery chargers but I use a laptop power supply that I was able to get one from my IT department for free since it was being sent to recycling. While they are lower power than the typical battery charger they are smaller, sealed (i.e. water resistant), and in my case free. The lower power simply means the parts need to stay in solution for a longer time and I have a feeling there is less chance of damaging the parts being cleaned. The modifications are simple, cut off the plug that goes into the laptop and identify which of the wires is positive and which is negative (the internal wires may already be color codes otherwise use a multi-meter). I then connected longer color coded wires (in my case I used heavy gauge speaker wire from radio shack) and attached an alligator clips to make it easier to connect the parts being cleaned. May of the posts I read recommended using “washing soda” mixed with the water however I find baking soda is much easier to come by and since “washing soda” is simply a stronger version of baking soda you can simply use more of the baking soda. Typically I use around a tablespoon of baking soda per gallon of water, but I am not precise in my measurements. For the process to work, the negative terminal needs to be connected to a piece of sacrificial steel or iron. I have read that if stainless steel (or other steels containing chromium) is used the process can release toxic gases and will contaminate the water with heavy metals. Additionally, you should avoid galvanized steel as you may end up Zinc plating your tool. I typically use re-bar because it is cheap and easy to find but I think cast iron works faster (maybe the porous structure increases surface area?). What is most important is the piece of metal should have a lot of surface area as this will dramatically speed up the cleaning process. This piece(s) of metal will eventually become unusable due to the buildup of corrosion however in my experience you can use them for multiple cleanings. Note: we are dealing with electricity and water together so be careful. Connect everything with the power supply unplugged and if possible, use a GFI outlet. Getting things started is simple: connect the part to be cleaned to the red wire; the sacrificial metal to the black wire and submerge both in the solution of water and baking soda, making sure the two pieces are not touching. Now set you bucket outside and plug it in (this process can release small amounts hydrogen gas which is flammable in enclosed spaces so do this in a well ventilated area), you should see a bubbles forming on the surface for the part being cleaned or streams of bubbles reaching the surface within a few seconds. Now sit back and wait. How long? That is the 64 thousand dollar question. It is going to depend on the strength of your power supply, the level of corrosion, the strength of your cleaning solution, the surface area of your parts, etc. I will typically check on the progress every few hours but seriously rusty parts I often leave overnight. Note the use of a nickle plated bolt, DON’T DO THIS. When the parts are done, they will be black in color and you should see none of the telltale texture of rust. Once it comes out of the solution you can either leave the black magnetite in place or remove it with a fine grit sanding pad. You then want to dry the part quickly and apply oil as flash rust can appear quickly. 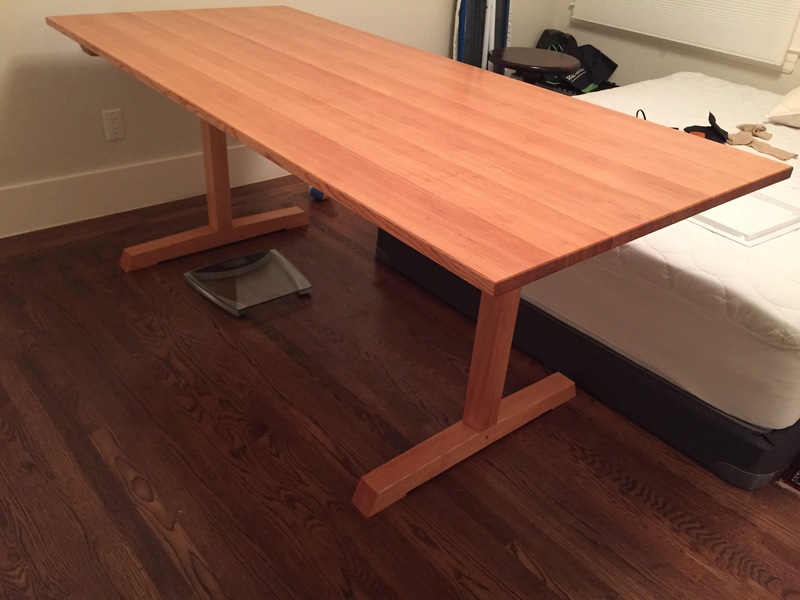 Not a ton of woodworking this weekend but I did get the finish on the table top. 4 coats of General Finishes high performance sanded with 320 in between. Overall, it’s okay but there are a few defects that would have taken several more coats to clear out so it falls into “good enough”. Final assembly and wax will happen next weekend in the meantime it will finish curing in the extra bedroom. I took advantage of my time at the airport and on the plane to come up with the final model for my bench. Using SketchUp’s Photo match tool I was able to come up with a reasonable version of the bench using inches rather than cm. My first version was close but the position of the foot rail was too low and the skirt was too narrow. A 1/8th inch set back for the skirt was less than I expected but 1/4 looked like too much. After a few adjustments I had the components the right size and had added a 1/4 bead along the skirt. In the end I ended up with three versions: the original (left), one where the side stretchers have an 1/8th inch reveal (center), and one that carries the round over profile to the side stretcher (right). Right now the middle version is my pick as the added reveal will help to hide any defects but I will see what SWMBO picks. I’ll Make the SketchUp file available once I figure out how but in the mean time here is the cut sheet for the middle version; I have not finalized the length yet but I am using 4′ 2″ between the outside edges of the legs. 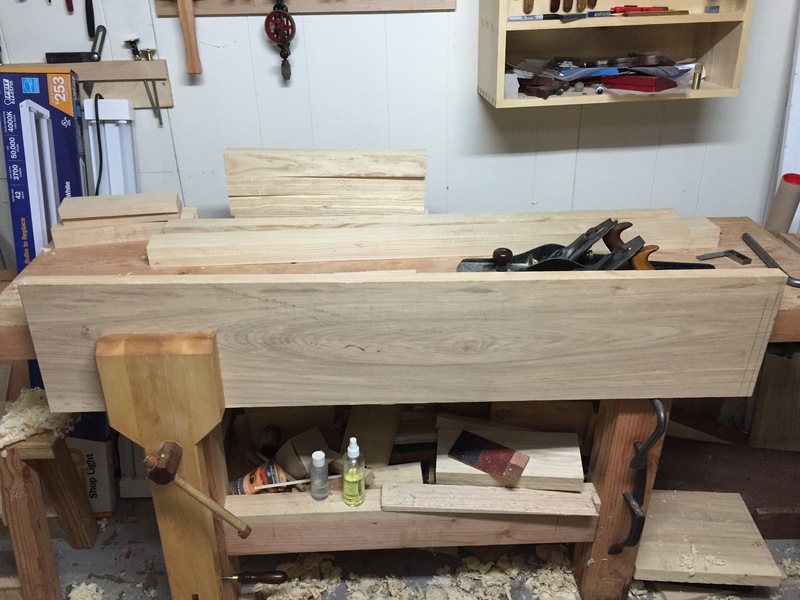 Edit 5-30-2016 – Realized I did not notice a long overhang on the ends of the bench which looks more like 3.5″. Top dimensions have been updated. In my mind, the next project is the back stool from the Anarchists Design Book but SWMBO is concerned (rightly so) that the planned dinning chairs may take a while. As a result she has requested that the next project be a bench for the dining table. So while I will be sneaking in work on the back stool, the official next project is a bench. 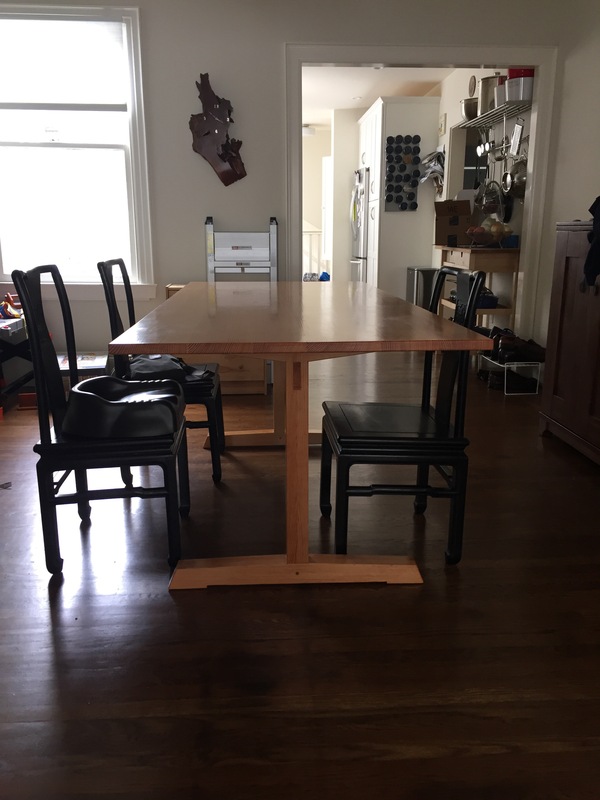 Because the plan is to build a set of 6 chairs the bench will eventually need a new home so it will be sized to act as a bench near the front door, under the coat rack. This means the bench seat needs to be fairly narrow (less than 12 inches) and no longer than 4’10”. After doing some searches on 1stdibs.com (which has become one of my favorite inspiration sources) I found this pair of french oak benches which fit the bill. The stated width is 10.5 inches, the style will go well with the contemporary shaker dinning table and the overall feel of the house. Most importantly, we both like the look. Dimensions/proportions took a bit of finagling. I printed out the end on image and laid out the sizing using the stated dimensions of the piece. I assumed a 1.25 inch thick two inch wide legs and a 1.5 inch wide stretcher/foot rail but the totals would not work out. Then I realized the height of the base was equal to 13 times the thickness of the stretcher/foot rail; 18 (estimated base height) divided by 13 resulted in a rail thickness of 1.3846 inches which was an odd dimension for what was certainly a factory produced piece. Then I realized I was being an Imperialist (well American Standard) fool and the dimension was likely 1.37795 inches, otherwise known as 3.5 cm. With that everything fell into place. Making some assumptions regarding human error (a common requirement in the data analysis work) I think the piece is 49 cm tall and 65.5 cm wide. I’ll need make a sketch-up model to finalize the ratio and convert to inches. The goal is to make this an inexpensive project and given its intended uses, I decided to look at inexpensive hard woods known for being hard (you know what I mean). The inspiration piece is made of that wonderful fine grained french oak so red oak would not look right. 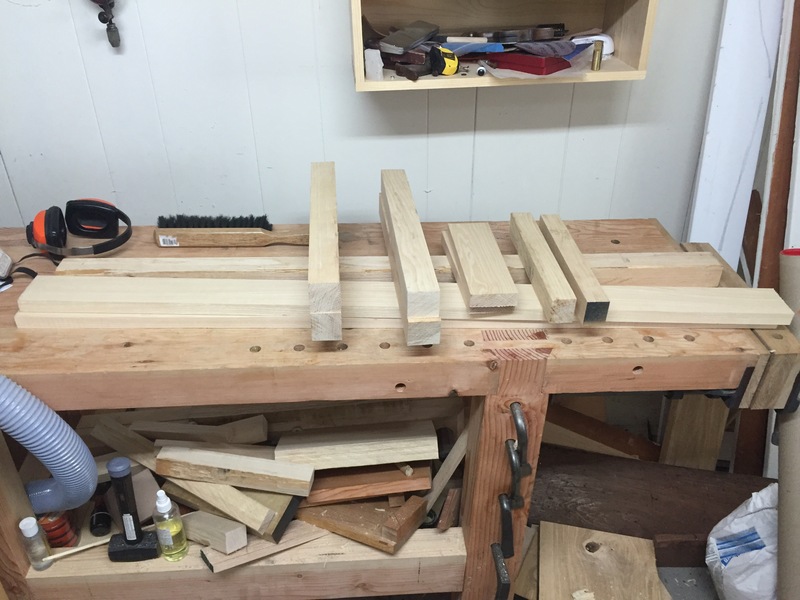 When I purchased the wood for my back stool I had purchased some 8/4 ash, mostly because it is the cheaper than red oak (I assume this is due to the ash die off happening in the USA right now) and there was a piece with straight looking grain. Ash has tight grain and takes stain well, plus I have so stock perfectly suited to making the legs. The plan is to build the base out of ash and decide on the seat when I find the right material.